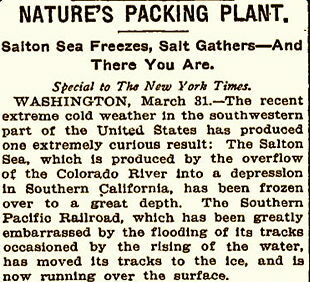 Salton Sea Freezes (1906) On its front page, The New York Times announced that the Salton Sea in Southern California had frozen and that local residents were ice skating on it. A few days later, the LA Times applauded the NY Times for this "masterpiece of fooling," but noted the implausibility of the report since the Salton Sea, being next to Death Valley, was "the nearest to the infernal regions, in winter or summer, of any spot on the crust of the earth." However, a few publications did reprint the story as genuine news. This appears to be the only April Fool joke the New York Times ever published. 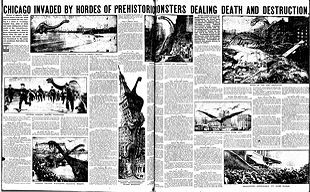 Chicago Invaded By Dinosaurs (1906) A double-page, illustrated feature in the Chicago Tribune detailed the city's invasion by "hordes of prehistoric monsters dealing death and destruction." 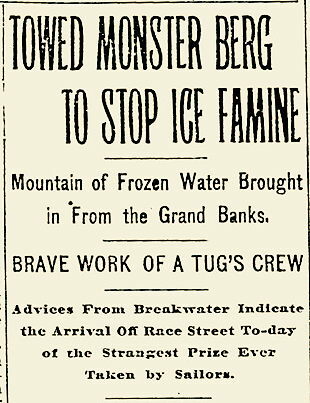 The Philadelphia Iceberg (1906) The Philadelphia Record announced that a massive iceberg had been secured off the banks of Newfoundland and was being towed to the city. Its arrival was expected later in the day and was anticipated to relieve the region's ice shortage. Hundreds of people reportedly went down to the river hoping to see the iceberg's arrival.